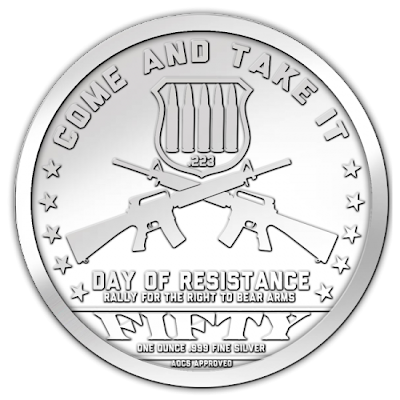 Coins Bullion: Day of Resistance One Ounce Silver Round "Come and Take it"
In partnership with the American Open Currency Standard, Day of Resistance is releasing its official silver round - The COME AND TAKE IT Second Amendment Medallion. 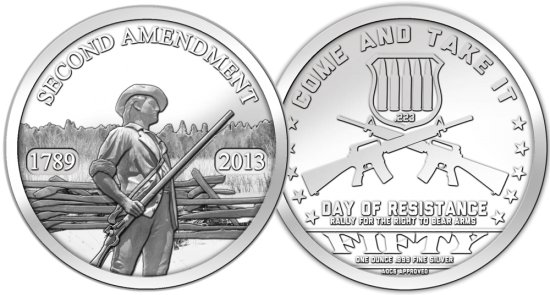 This .999 fine silver medallion bears the famous image of the Concord Minute Man of 1775 statue from Massachusetts on the obverse and COME AND TAKE IT with crossed AR-15s on the reverse. This medallion is being released on February 23 (.223) as we both celebrate our right to protect ourselves and stand, unwavering, in our resolve to resist the federal gun grab that has targeted our self-defense rifles - most notably the AR-15 which, as you already know fires .223 Remington ammunition. This .999 fine silver medallion is minted with a satin finish and is bullion priced at only $2.99 over spot (that's less than silver eagles in low quantities) to encourage you to stack. Most collectors will pick up a tube of twenty of these, both for their collection and as an investment. This limited edition medallion features the minute man on it's obverse and the ever-popular "Come & Take It" phrase on the reverse floating above crossed AR-15s which have come under heavy fire from the media and the President in recent months. This beautiful medallion was created as a token of our right to bear arms. Minted on an AOCS approved, .999 pure silver medallion, this piece represents a movement of proud Americans who will peaceably assemble on February 23 (.223) to tell the federal government that they have no authority to take away our ability to protect ourselves. This most basic right has been at the cornerstone of the American tradition since before we were even founded as an independent nation from England. As the sacred latin phrase says "abusus non tollit usum"
Which means "abuse does not take away use, i.e., is not an argument against proper use"
This is far from the first time a government has tried to grab our guns. It's not even the first time our government has tried. Throughout history in Russia, in Germany, even in the Texas War of Independence. In 1835 "Texians" stood up against Colonel Domingo de Ugartechea of the Mexican Army when he tried to take away their cannon. Before the battle of Gonzales, which many consider the beginning of the Texas Revolution, they raised a flag for the Mexicans to see. It boldly stated the words "Come and Take It." On January 16, 2013, President Barack Obama issued 23 executive actions against your 2nd amendment Constitutional right to bear arms. He did this without the consent of Congress which in itself, violates the foundation of the Constitution and the co-equal branches of government. In response to these unconstitutional actions by the President, on .223, February 23, 2013 the American people will stand together in defiance to protect the right that protects ALL of our rights, the 2nd Amendment! They will organize locally so that they may band together neighbor to neighbor and reassert their community's right to determine their own destiny! This medallion is more than just a commemorative token from an event. It is another way of resisting the Federal Government. Since the beginning of the 20th century our government and governments around the world have distanced themselves from gold and silver as they not only drowned us in a sea of debt, but actually transformed our currency from claims for gold and silver to a debt-based currency. Every ounce of silver you own is one more vote of nofaith in the federal government. See the Why Silver? page above for more information.